A Quantitative Approach to Commercial Damages explains the complicated process of measuring business interruption damages, whether they are losses are from natural or man-made disasters, or whether the performance of one company adversely affects the performance of another. Using a methodology built around case studies integrated with solution tools, this book is presented step by step from the analysis damages perspective to aid in preparing a damage claim. Over 250 screen shots are included and key cell formulas that show how to construct a formula and lay it out on the spreadsheet. Often in the course of business, a firm will be damaged by the actions of another individual or company, such as a fire that shuts down a restaurant for two months. Often, this results in the filing of a business interruption claim. 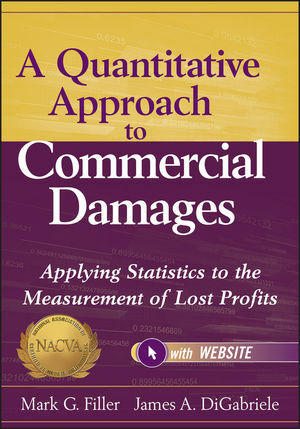 Discover how to measure business losses with the proven guidance found in A Quantitative Approach to Commercial Damages. Mark G. Filler, CPA/ABV, CBA, AM, CVA, is President of Filler & Associates, a valuation and litigation support practice. He recently was also chair of the editorial board of NACVA's The Valuation Examiner and coauthor of NACVA's quarterly marketing newsletter Insights on Valuation. Filler has published various articles and is recognized as a qualified expert witness, testifying frequently on business valuation, commercial damages, and personal injury matters at depositions and in state and federal courts. James A. DiGabriele, PhD/DPS, CPA/ABV, CFF, CFE, CFSA, CR.FA, CVA, is a professor of accounting at Montclair State University and has been published in various journals, including Journal of Forensic Accounting, Journal of Business Valuation and Economic Loss Analysis, and The Value Examiner. Dr. DiGabriele is also Managing Director of DiGabriele, McNulty, Campanella & Co., LLC, an accounting firm specializing in forensic/investigative accounting and litigation support.